There are only so many weekends in a month, and this November has proven to be way too little. There are so many holiday recipes I want to bake up over the weekend, and not enough hours in the day to do it! But as promised, I'm making Cranberry walnut rolls this week. I thought these would be a good roll to bring for Thanksgiving. And it's the one roll that my husband always seems to buy for himself when he's at the market. 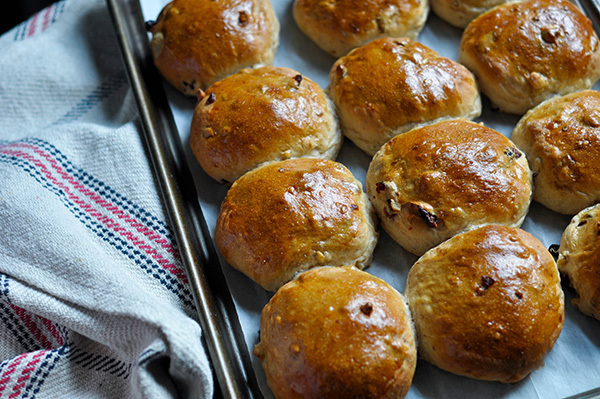 Slightly sweet, with a tang from the cranberries and a rich crunch from the walnuts, these rolls are perfect for any meal. I don't think I can get enough of this flavor combo... I know this classic roll will become a staple at your Thanksgiving table! I set out on a recipe search for a cranberry walnut roll that didn't looked moist and tender. I know they always say not judge a book by its cover, but that is exactly what I do with recipes! I can usually tell by the pictures if the end product would come out the way I want it to. Most recipes looked dense and dry, until I found this one from the Brown Eye Baker. Her rolls looked just the way I imagined these to be and after a once over on the recipe it had all the elements I knew to make a good bread dough. Namely, Sugar, and oil. However, I did doctor up this recipe up a bit with some whole wheat flour and a bit more sugar. So basically I upped the nutrition, then took it a bit down hill with the sugar. But hey, it's the holidays right? All in moderation! Though when it comes to my bread/carb intake this time of year, all portion control goes out the door! The dough is a bit wet once mixed. But as long as it comes together into a ball, you're good to go. I find that a moist bread dough yields a much softer roll that one that is too dry. The dough gets proofed and shaped into 12 rolls. I placed these dough balls onto a parchment lined sheet tray and allowed them to rise another hour. Then it was a quick egg wash and popped into the oven. The rolls baked up beautifully brown. Serve warm with a pat...or two of sweet butter. It really doesn't get better than fresh bread with your meal and this recipe makes it a breeze to do! I hope you will add this Cranberry Walnut Roll to your holiday table this year! Mix flour, brown sugar, yeast and salt in the bowl of a stand mixer fitted with a paddle attachment. Warm the milk in the microwave for 30 seconds. Add the oil, milk mixture and 1 egg to the flour mixture. Mix on low speed until a wet coarse ball forms, about 1 minute. Add the nuts and the cranberries. Replace the paddle attachment on the mixer with a dough hook. Mix dough on low speed until smooth, elastic, and slightly tacky. Add more flour by the tablespoonful, if the dough doesn't come together into a ball. I added about 1/2 more flour. Allow the machine to knead for about 8-10 minutes. Lightly oil a large bowl. Shape the dough into a ball; place in the prepared bowl, turning to coat with oil. Cover with plastic wrap and let the dough rise in a warm spot till it about doubles in size, about 1 1/2 hours. Line a large baking sheet with parchment paper. Punch the dough down and transfer it to an unfloured surfaced; divide into 12 equal pieces. Shape each piece of dough into a smooth round ball and place on the prepared baking sheet, about an inch apart. Cover loosely with plastic wrap or cloth and let them rise for, another hour. Preheat to 425 degrees F.
Brush rolls with egg glaze. Place rolls in oven; reduce oven temperature to 400 degrees F and bake 7 minutes. Rotate baking sheet; continue to bake another 8 minutes longer or until golden. Cool completely on a cooling rack.